This just in, vis Stuff About Minneapolis Tumblr : Oak Street Cinema is officially closing its doors to the public. Star Tribune reported several weeks ago that the cinema "is expected to be sold after the Minneapolis-St. Paul International Film Festival ends May 3." 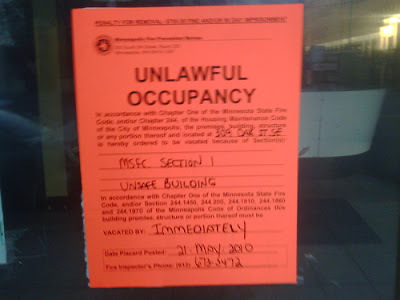 It appears that the local fire department paid them a visit in the meantime: this sign was spotted at the front door of the beloved movie theater saying the building is "unsafe" and that it needs to be vacated immediately. Oak Street is (or was, at this point) a favorite destination for local movie buffs, since their repertoire included not only classic American films, but also a variety of foreign flicks and cult favorites. It is undoubtedly a sad affair, as one commenter says on Tumblr: "place that turned me into a pretentious film studies minor. Sad times."